Create stencil letters out of any installed true type font. The program will insert apertures so that the letters stay connected when you cut it out. You can print or plot the letters or export the letters as DXF file. Print your own very big posters and banners! Scan a picture and print it out very big. You don't need a special printer! The program prints the posters on many pages and you can put them together with glue. Edit the pictures with the integrated picture editor "ImageArtist". The program converts documents of any program like Word, Excel etc. into bitmap files. You can save this bitmaps as JPG, TGA, TIF, ... files. The corresponding program for the document (e.g. Word) must be installed. The import takes place with the help of OLE2. 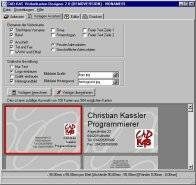 The program is especially useful together with "CAD-KAS Poster-Printery". With both programs together it is possible to print Word files etc. as big posters. Now you can have a Business Card for every occasion! Select from nearly 20,000 ready-to-use-card layouts. Our intelligent software automatically includes your mailing address as well as your Email address, Home Page URL, and Fax and telephone numbers. You decide what information you want on your card! You can call on your imagination and creativity to design your cards, using the different text effects that are included with the program. In addition, you can open and scan photos. And, if you don't want to print out your business cards, you can also send them by Email! Create your own paper forms for printing. Do not care about the layout at all. Simply enter all you want to query: name, street, city etc. Possible fields are text fields or free size, checkbox fields and radio fields. You can sort the fields into different segments (categories). Write an introduction text for each of the segments or add an image for the segments. You can also include your company logo in the headline. Design and print your own menu cards yourself! You only input all dishes and drinks into the program and change the layout a little bit. And ready is your menu card. Because the product information will be stored separated from the layout you can change the products and prices very easily anytime. You can export the product information as CSV file. Would you like to make your printer and scanner more useful? Then this program is the right one for you! This color photocopier program makes copies of your documents. You can define the number and the size of the copies. You can also edit and retouch the documents. Virtual notepads and comments are possible. Fill out paper forms on your computer. You don't need your typewriter anymore to fill out forms! First you scan the form. Then you can create some form fields. In the next step you can fill out the forms. Now you can print on the original paper form to fill it out or you may print out the scanned form with the texts on a blank sheet of paper. With this program you can fill out every form, e.g. transfer orders, cards, tax forms. Start using your printer for a useful job! Print your photos and pictures with CAD-KAS Photo-Printery! With the program you can create collages out of your picture material. You can arrange pictures as desired on the worksheet and change the size of this pictures. By request the program arranges the pictures automatically. You can write a free text for all photos. Do you ever wished to print or save/export more than one eMail a time in Outlook Express? The program can print as much eMails with one click as you wish. Also it saves multiple eMails as HTML or EML files for you. You can choose a new layout if you don&apos;t want that the printout or html file looks to simple. You can create new html templates for your personal layouts too! eMails don&apos;t have to be without color! Print you own CD Covers for your Audio and Data CDs or DVDs! You can open a picture or scan a cover and add text, notes and graphic objects. Then you can print it out as CD cover or CD label. The program has some function to retouch the scanned picture too.